To the average person, there is nothing especially interesting about a bank. Like the post office or DMV, banks are often considered important institutions we rely on, but not exactly our favourite places to visit. Despite its mundane veneer, however, the banking industry is quietly undergoing a radical transformation, and how you interact with your bank or credit union will be dramatically impacted. Additionally, as more transactions are completed via debit, mobile and person-to-person (P2P) payment apps, Cooke said these technologies will replace many services commonly performed in-branch. So what does this mean for the future of banking? The emergence of cost-effective, convenient digital services combined with shrinking branch numbers will contribute to the extinction of several common banking services over the next several years. 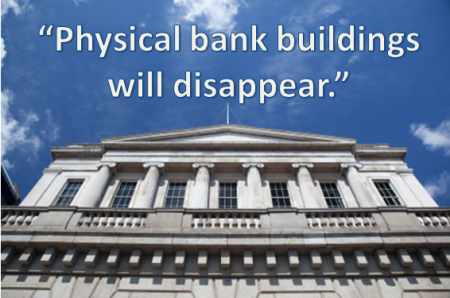 Banks and branches have always gone hand-in-hand, but the traditional, brick-and-mortar bank branch is beginning to die off. According to the The Wall Street Journal, the number of U.S. bank branches has steadily declined since 2009, with banks cutting a net 1,487 branch locations in 2013 alone. “While online banking still seems foreign to the older demographic today, in 10 years this will not be the case. The younger demographic already appreciates the convenience of online banking, and the transition of not physically being able to go to a bank building will not be a problem. As it is today, our smartphones allow us to virtually walk around with a bank in our pocket,” LaRoe concluded. A February 2014 poll conducted by GOBankingRates found that 38 percent of respondents never write a check, while just over 16 percent reported they only write a personal check once a month (see the full poll results here>>). Greg Meyer, community relations manager for Meriwest Credit Union, explained, “With the proliferation of online banking and chipped debit cards, there will be a further reduction of printed checks being used to pay for items.” Meyer projected that online banking bill pay, mobile wallets such as Amex Isis and Google Wallet, as well as P2P systems will eventually replace checks, noting that less than 7 percent of banking transactions today involve a paper personal check. “Many credit unions are already offering a type of P2P payment system for their members,” Meyer noted. Paper is not only less convenient than digital options, it’s wasteful and costly for both financial institutions and customers. From deposit slips to paper statements, to any type of “snail mail” correspondence, banks and credit unions are looking for ways to cut any and every paper-based service in favour of online and mobile options. The move from paper to online communication, transactions and applications helps eliminate the costs associated with printing and postage, as well as streamlines day-to-day banking operations. Soon enough, bank customers won’t see a single sheet. 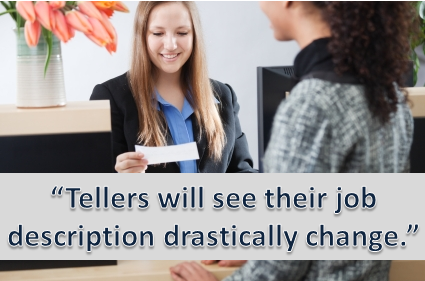 Today’s tellers facilitate in-branch services like deposits, withdrawals and other basic needs of customers. They’re by no means financial experts, existing to help customers with basic banking activities. However, as the number of physical bank branches declines and simple transactions move online, the role of the teller in financial institutions will shift. Most banks and credit unions offer asset management services in addition to basic accounts and loans. Traditionally, asset management clients meet with a financial planner to discuss their financial situations in depth and plan a road map for the future. This in-person service is likely to disappear along with most other face-to-face communications. Additionally, Moore pointed out that banks will be able to take on clients with smaller portfolios thanks to the greater savings and efficiency of moving online, opening up the opportunity to receive affordable financial planning from a professional. As Mary Shelley famously wrote, “Nothing is so painful to the human mind as a great and sudden change.” Indeed, these coming shifts in how we interact with financial institutions will likely be met with resistance by many. But those who accept change in the banking industry and adopt new technologies will be the first to reap their benefits.